As we reported on July 27, Turkish Vice-Prime Minister Mehmet Simsek announced Erdogan’s meeting with his Russian counterpart Putin in St. Petersburg on August 9. As was previously announced, both presidents met today in the Constantine palace in St. Petersburg in an effort to normalize relations between their countries, which have been severely strained by the downing of the Russian fighter jet on November 24, 2015. During the meeting, President Putin noted that the normalization of ties between Turkey and Russia will be to the benefit to both nations. Putin explained that the relations between two nations have been strained since the downing of the fighter jet, but noted that Erdogan’s visit demonstrated the willingness of both nations to engage in efforts to normalize ties. Putin commented on the July 15 failed military coup attempt in Turkey, saying: “Russia is against any action that goes against the Constitution”. Speaking directly to Erdogan, Putin said “I have no doubt that the Turkish people will overcome this, under your guidance”. The Russian President told the press that the main topics of today’s meeting will be: normalizing ties, and a discussion on their joint fight against terrorism. 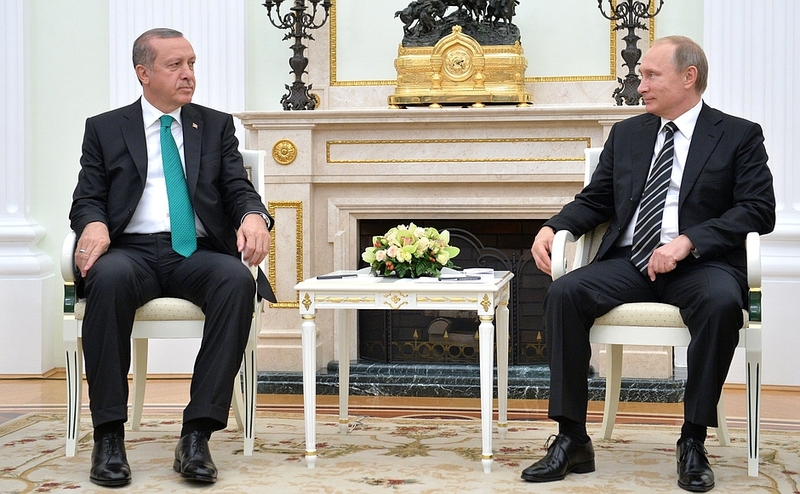 Turkish President Recep Tayyip Erdogan told the press he hopes that Turkish-Russian relations will be improved by today’s meeting, and will hopefully evolve into the next stage. The Turkish President explained that the region has great expectations from both nations; “I believe our solidarity could help solve many regional issues,” Erdogan added. The downing of the fighter jet by Turkey during the Russian campaign in Syria seriously strained ties between the two nations, and resulted in travel and economic sanctions. However, Turkish international efforts to normalize ties with other nations, recently resulted in normalizing ties with both Russia and Israel. On the other hand, friction with “traditional” Turkish allies such as the US started after the failed military coup attempt; diplomatic tensions between Turkey and the US were initiated by Turkey’s request to extradite Fetullah Gulen, a US based Islamic scholar who is accused by the Turkish side for orchestrating the coup. While the US maintains its position that extradition procedures have to be respected, this is seen as a stalling tactic by Turkey, who called for the US to demonstrate its friendship by extraditing Gulen.